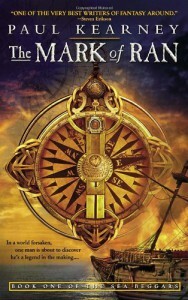 The Mark of Ran by Paul Kearney is the first in the Sea Beggars duology. As my mind wanders over the story and its characters, I'm not quite sure where the series title comes into play. 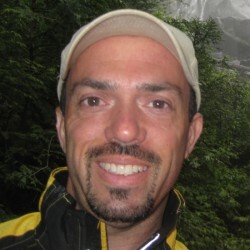 The main character, Rol Cortishane, is at times without home or hearth, but never does he beg. He never needs to. Cast into the world after his guardian/grandfather is slain by an angry mob, Rol seeks out an old associate of his grandfather's in whom he finds a mentor willing to train him in the ways of his ancestry. Rol is not human. While he looks human enough, certain traits come to the forefront when Rol is pushed emotionally or physically: his eyes glow, his strength is superhuman, and he heals quickly. While the story here is entertaining enough, it seemed to jump from place to place a bit too often with less than smooth transitions between. Much of the tale revolves around Rol's initial training, his interactions with his mentor, and his love/hate relationship with the mysterious and beautiful Rowen, who is not human, either. About halfway through, Rol takes to the sea, and while I expected the story to really take off from that point, it instead fizzles in a somewhat predictable direction. I've heard good things about Kearney, so it was with some disappointment I have to say that I will not be reading the second book in this series. The author's Monarchies of God and the novel, The Ten Thousand, have both stood out in others' reviews, though, so I'll set my sights on those the next time Kearney's name comes around.